We are now into the fourth year of the US Federal Reserve’s “emergency” low interest rates. While the benefits of this near-zero interest rate policy may finally be showing up in terms of sustained US economic growth, the perhaps unintended consequences of low interest rates are also coming home to roost. What is stunning is that interest income has fallen by almost $450 billion since the beginning of the financial crisis. In 2008, when interest income peaked, interest income represented over 11% of total personal income; now it is 7%. 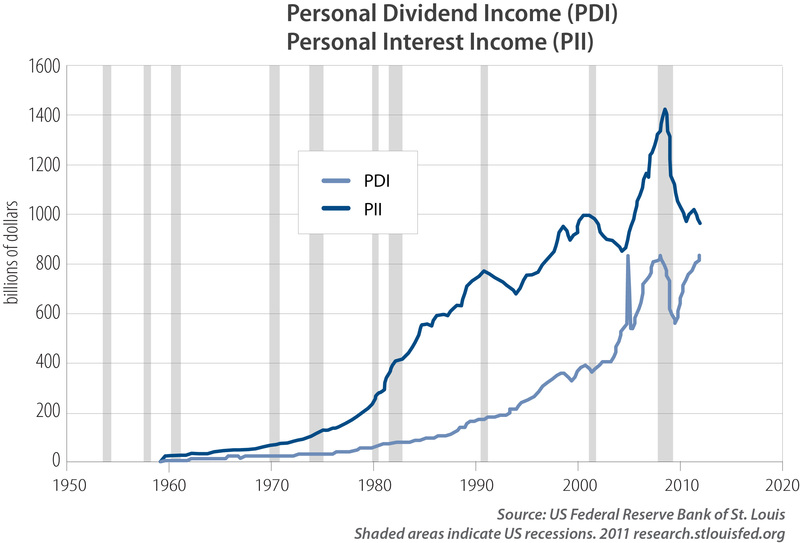 Why has personal interest income fallen? Lower “emergency” interest rates. Who has borne the brunt of the interest rate decline? Savers in general, but hardest-hit are retirees and those nearing retirement. While emergency low interest rates have been beneficial to governments and financial institutions with large borrowing requirements, low rates have created an emergency for those who depend on investment income to maintain their standards of living. One of the reasons for the decline in interest income is the roll-over phenomenon. Debt that was purchased years ago at much higher rates is now maturing and being rolled into new debt that carries a significantly lower coupon. The other reason is simply that interest rates are going down faster than debt is going up. Financial oppression may mean a reduction in income of 40% or more. For example, in 2008 an investor could have bought (or rolled-over) a 10-year Canada bond at an interest rate of 3.75%. Today the yield is 2%. Where $100,000 would have bought annual interest income of $3,750 four years ago, today all one gets is $2,000 of income, a 46% reduction. When interest rates finally begin to rise the story for savers doesn’t get much better. Quite simply, if rates go up the value of a bond purchased at today’s record low yields will fall and could fall sharply. If the price levels increase (inflation) the buying power of today’s low level of interest rates is even further reduced. Remember the 1970s and the pain felt by savers who confronted a decade of inflation with a fixed level of interest income? Is there an out? Look at the light blue line on the chart. This is dividend Income, or the cash return from owning stocks. Like interest income, it has gone up through the years. Most important, however, is that it is going up today. Of particular interest is the short- lived downtick in the dividend income stream in 2009. During the financial crisis, many companies chopped their dividends, particularly US financial companies. However, in less than three years the cuts were virtually made up, and dividend income continues to grow. Despite the slow recovery, dividend income grew at 6% in the last 12 months. Just as governments have benefitted from lower interest rates, so have corporations. The good news is that lower interest costs mean corporations can support higher dividend payments to shareholders. Coupled with reduced debt levels in general, deleveraged corporations are in an even better position to pay more to shareholders than they have been in recent times. We continue to maintain our view that the best income is dividend income, and the best path to a secure future is buying and holding equities, not debt. The light blue and the dark blue lines look to converge; we want to own the light blue line. Our focus remains on finding the companies that grow their dividends.